John Sears, Lady, Little Girl, and Pepper, also known as the 3 Mules, have touched the hearts of many people during their 31 years living outdoors and traveling together throughout the western United States. We don’t see too many mules on the roads these days, which has led me to wonder, why not? And why are the 3 Mules, so loved by some and so discriminated against by others? I felt drawn to learn more about mules in general and found great information on LuckyThreeRanch.com. The first mule breeder in the United States was George Washington, who aside from being one of our most important founding fathers and first president of the United States of America, George was also an enlightened agriculturalist and visionary who from early on saw the true value of the mule and wanted one. The major obstacle George faced in obtaining a mule at the time was that the Spanish Government prohibited acquisition of the legendary Andalusian Donkey. Because the mule is a cross between a donkey and a horse, obtaining a mule was a problem for George Washington. In 1785 King Charles III of Spain presented Washington with a gift of two jacks (2 male donkeys) and two jennies (2 female donkeys). Unfortunately during the voyage to the newly formed United States of America, one of the jacks died. The surviving jack, whose name was Royal Gift, lived on to sire an American dynasty that literally reshaped the landscape of our country. By the early 1900’s, the mule population in the United States exploded to almost six million. With the advent of engine powered vehicles, the once critical role in agriculture and industry by mules was diminished. By the late 1960’s, fewer than 10,000 mules existed in the United States. Many of these mules languished, unused, unnoticed, unappreciated, and in danger of fading from our culture altogether. A handful of mule and donkey lovers were determined to keep the extinction of mule from happening. In 1967, Paul and Betsy Hutchins founded The American Donkey and Mule Society, dedicated to the protection and understanding of the long ears. They publish The Brayer, a bi-monthly magazine with an international subscriber base. Mules and donkeys resurged in popularity during the last 40 years with annual events like Bishop Mules Days in Bishop, California, which hosts more than 30,000 people and 700 mules. Mule stock shows, trade publications and television programs, such as Meredith Hodges’s Training Mules and Donkeys, foster interest in these amazing animals. Mr. Sears and his beautiful mules add color and character when we see them walking throughout California’s populated and rural areas, passing steadily and surefootedly without blinking an eye. Most people who see the 3 Mules smile at first sight of them. The 3 Mules are patient and kind when approached by curious people who want to meet them. 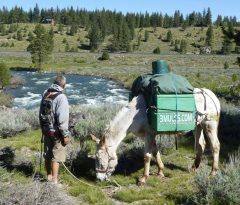 When some see 3Mules.com written on the mule’s pack, immediate reaction is to go online and look up the website to learn more. Other people seem to be panicked or suspicious to see a man traveling with mules in our midst and report the unusual sight to law enforcement. The range of reasons why some think that the 3 Mules should not exist and cohabitate among us is astonishing. It seems that collectively as a society we have forgotten a lot. Educators used to take students on field trips to see various kinds of animals. What happened? The 3 Mules show us to step back and look at our situation and the damage our urban sprawl is creating. Instead of arresting, jailing and impounding or being afraid of these beautiful rugged steady slow travelers and their capable handler, our society should reflect how we can better serve ourselves and our planet. The 3 Mules are expressing the urgency that so many of us feel, that it is time to be proactive and do something to help our planet and all of us who depend on it for life. Our society should embrace and celebrate these beautiful, strong, steady, smart animals and capable individuals like Mr. Sears, who knows how to handle and care for his mules, and who loves the planet where he and all of us were born. The 3 Mules are sharing their journey with us and what they have learned. How many of us could live outdoors every day and night for 31 years? Mr. Sears is the only person I know. It is remarkable how organized, self-contained and simplified his life is.